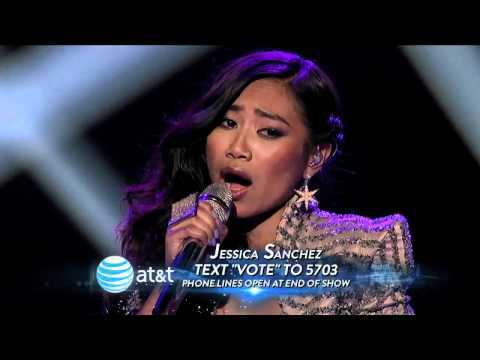 Jessica Sanchez left the judges breathless as she once again showed her powerful pipes and impeccable vocal technique Wednesday night on American Idol. The top seven Idol hopefuls were assigned to sing songs from the last three years. The part-Mexican, part Filipino singer took a risk with the unfamiliar jazz and soulful song “Stuttering” by Jazmine Sullivan, but the judges gave Sanchez two thumbs up on her rendition. Aerosmith rock star Steven Tyler gave Sanchez top-notch reviews, not only on her singing but on her fashion sense as well, comparing her with fellow judge Jennifer Lopez. “You had the nerve to sing a great song and you had the nerve to wear Jennifer’s shoes,” Tyler added excitedly as the audience quickly got to see a close-up of Sanchez’s spiky black heels. Although Lopez agreed with Tyler and told her she has “great taste,” she compared Sanchez to possibly her biggest competitor—Joshua Ledet. Guess JLO might not have liked Tyler’s comment after all. Sanchez and Ledet are two of the strongest contestants of season 11 and in the last few weeks have performed multiple medleys together, which have earned the two standing ovations by the judges and the audience. « ARE YOU A LATINO LEADER WHO WOULD LIKE TO HOST A GRASSROOTS FUNDRAISING PARTY FOR PRESIDENT OBAMA? 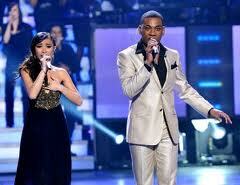 Yet, the consersus seemed to favor Skylar, and Hollie’s the climb seemed to be the favorite performance of the night? I see a four way tie. Anyone else notice that Miss Sanchez who even sang a song devoted to her Mexican American father this week has a very quiet almost invisible Latin fanbase? She even has youtube songs sung in spanish! She also tried to adapt a Gloria Estefan tune. Good thing other communities believe in her and want to see a new era on Idol. This would be much easier if the Latino community got their votes out too! Good site you possess going here.